I, like many other beauty lovers, get very excited when Too Faced bring out a new collection as you can always guarantee the cutest packaging can't you? 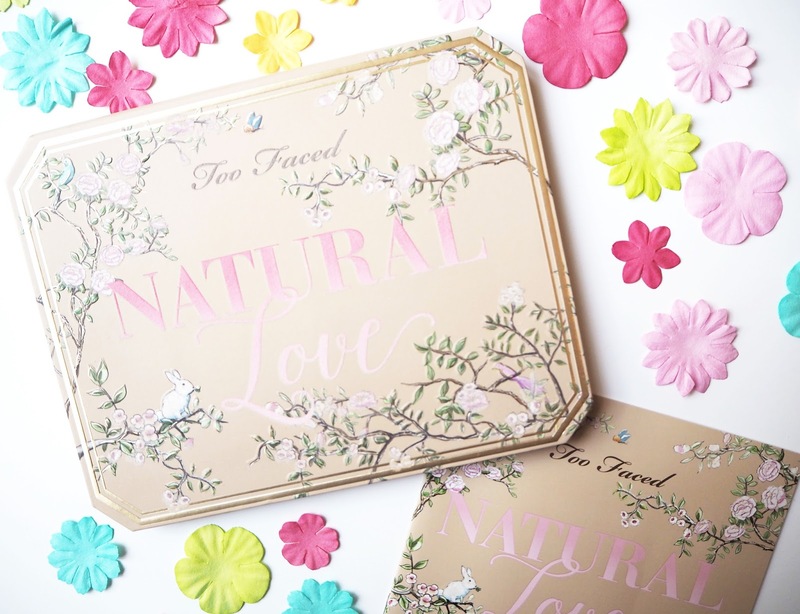 Fortunately we were not let down with the Natural Love Palette. I had been a bit undecided on whether to get this or not but once I saw it in the flesh all doubt went and I marched off to the till with the palette in hand. The palette features an almighty 30 shades and costs £52. It features a pretty 'nature' inspired design with leaves, flowers, an ickle bird and a cute bunny. The detail is raised with a velvet texture which whilst it has no function, its a nice touch. I also love the mahoosive mirror! As the name would suggest, this palette is made up of mainly neutral shades so you can create a tonne of looks for day to day, of course though there are a few bolder shades chucked in for when you are feeling a bit more daring. There is a good mixture of matte, shimmery and a few of the shades I would say fall into the 'duo chrome'' bracket. I'm not going to talk through every shade in detail as we will be here foreverrrrr but I have swatched them all below so you can see. For me my favourites are Honey Pot (a gorgeous gold), Hot & Bothered (a red, bronze with gold shimmer) and Honeymoon (a pink, gold). 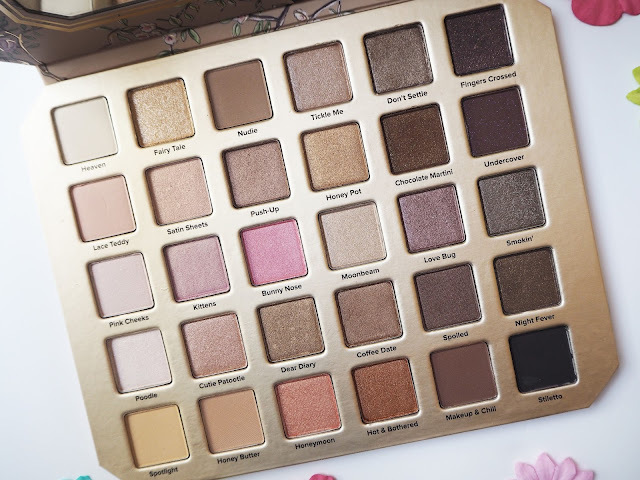 The pigmentation in general is the usual standard you would expect from Too Faced, the shadows feel very smooth and soft. I would definetely make sure you use a flat shader brush for the shimmers to really pack on the colour as with a fluffy brush I found the colour quite tricky to build up. There are a couple that I found don't quite match up to the others and I think this shows in the swatches- Make Up & Chill comes out a little patchy as does Smokin' which whilst it's a bit disappointing I can live with it as I love the others. Overall do I think this palette is worth the money? Obviously its a lot of money... a lot. I would say if you're looking to treat yourself and you want a palette that will have you covered every day then yes it may be worth it but I also think there are many other great alternatives out there that are way more purse friendly. If you're just a collector like me then I would probably recommend to get it as its so cute, well designed and will make a welcome addition. I really like the quality of Too Faced's eyeshadows.. I think they are my fave formulation of eyeshadows because they are so creamy.. thanks for swatching all the shades they are absolutely stunning!